Cut the cabbage in 4-8 slices, remove the hard white stem part, shred the cabbage. In a heavy steel pan add oil and brown the sugar. Add onion, cut in half and spiked with the cloves, and saute 2 minutes – this is how my mom used to do it. (I change this technique sometimes to finely chop the onion and simmer it and use clove powder so the cloves don't need to get removed before serving.) Add cabbage and toss it, then add the red balsamic vinegar – that gives the red color – toss it all in the pan, sauteing it until it wilts, 3 to 5 minutes. Add the cleaned and grated apple, the bay leaf and cinnamon stick, season with salt and nutmeg add the red wine and let it simmer on low flame for about 45 min, stir it ones in a while. I use a pressure cooker on very low flame to keep all the liquids in the pot. Few minutes before serving add precooked maroni (chestnuts) – that's extra yummy, it ads a natural sweetness and distinguished flavor! Red cabbage is great with "Spätzle" (a specialty from southern Germany) or with mashed potatoes, cranberry sauce and roast duck or game, or beef stew (ragout) and chestnuts. 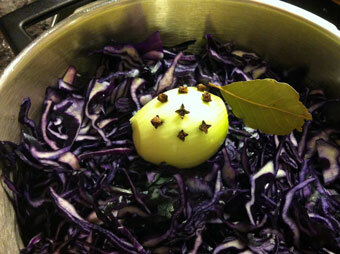 And: red cabbage is even more delicious when warmed up the next day!